Second Italian generalist public channel. Third national public channel. More culture and news than Rai Uno and Rai Due. Generalist television channel broadcast by the Mediaset Group. Since 8th september 2015 Rete 4 broadcasts entirely encrypted. You need a Tivùsat decoder to continue watching. New frequency since 15/06/2015. Encrypted since 8th september 2015. Generalist channel broadcast by the Mediaset Group. Since 8th september 2015 Canale 5 broadcasts entirely encrypted. You need a Tivùsat decoder to continue watching. Generalist channel broadcast by the Mediaset Group targetting the teenagers. Since 8th september 2015 Italia 1 broadcasts entirely encrypted. You need a Tivùsat decoder to continue watching. News channel broadcast by the Mediaset Group. Education and culture, especially history. Public sport channel. Rai Sport since 5th February 2017, Rai Sport 1 (2010 to 2017), Rai Sport Più (2008 to 2009). UniNettuno University TV (formerly Rai Nettuno Sat 1). University courses of the UTIU (Università telematica internazionale UniNettuno). Engineering, law, economics, psychology and literature. Lifestyle programming focusing on home decoration and restoration. Woman's lifestyle television channel about weddings. Roman Catholic channel owned by the Italian Episcopal Conference. 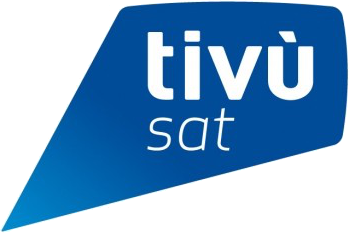 Launched as Sat 2000, renamed as TV 2000 in 2009. Roman-catholic religious channel by Capuchins of San Giovanni Rotondo. Sport channel specialised in tennis in high definition. Public television channel from the Republic of San Marino. Slovene-Italian bilingual television channel based in Koper (Capodistria in Italian), Slovenia. The European Union's TV information service launched in 1995. It provides EU related audiovisual material via satellite to media professionals. The programming consists of a mix of live events, news items, stockshots on EU policies and issues. Bilingual channel in Italian and Arab. Expo Milano 2015 television channel. 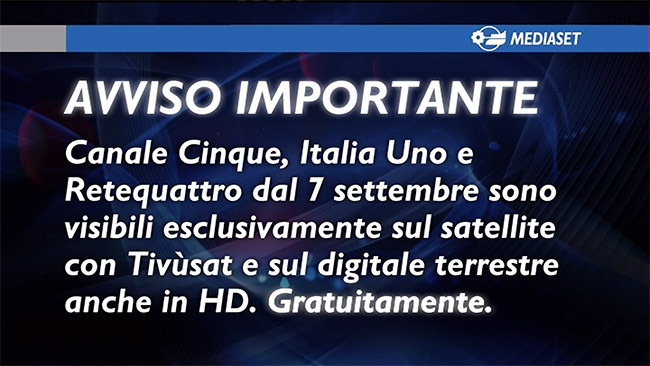 AVVISO IMPORTANTE Canale Cinque, Italia Uno e Retequattro dal 7 settembre sono visibili esclusivamente sul satellite con Tivùsat e sul digitale terrestre anche in HD. Gratuitamente. Rete 4, Canale 5 et Italia 1 are now entirely encrypted. You need a Tivùsat decoder and its smartcard activated to continue watching these channels. I what to get Tivùsat smartcard. where can i buy it? I don't want buy it on online so is there an other way? Thank You. Mediaset , e' veramente disgustoso che per noi italiani all estero dobbiamo pagare per icanali! Da ora in poi guardero' solo le RAI, siete veramente caduti in basso!!! i have a question, i have tivusat i do watch also canale5 rete 4.....and italia 1......but i reside in portugal.....my question is can i tune these chanels for HD ? Please, before asking, visit the corresponding page: Tivùsat. L'annunciatore di Rai Internationale informa che dopo questo programma, andra; in onda :Il Commissario Montalbano e, natturalmente il Montalbano NON appare. Perche' mai e perche' non informate il pubblico che Montalbano apparita' pagando un tanto per episodio da una Ditta privata? Since 6th April 2018 only San Marino TV HD on satellite. San Marino TV SD left. Where are you ? At which satellite is your dish pointed ? Tell us the only Italian channel and three or four other channels than you can see. Hi I am unable to get Top Calcio 24 on Hotbird 13 E, I am in UK. Has this channel been moved or changed frequency. Top Calcio 24 HD left Hot Bird 13° East. Top Calcio 24 SD continues on 12700 H 11175 Eutelsat 5WA 5° West, identified as MONDO CALCIO, as indicated in the above list.